If you?re looking to buy a low budget and dependable small car, look no further than the new 2018 Kia Rio.? Available as a four door sedan or hatchback, the Rio is sporty and well defined small car, both outside and inside.? The subcompact Rio is fun to drive and has a user friendly interior and infotainment system. It comes with a standard 5-inch touch screen display, satellite radio, and Apple CarPlay and Android Auto. Power windows and cruise control are optional. To keep production cost down, navigation is not available on the Rio, so you?ll have to use the one on your mobile phone.? The 2018 Kia Rio comes in three trim levels – LX, S, and EX. The entry level model starts at $13,900 for the LX base model and goes up to $18,400 for the top level EX.? The hatchback models range from $14,200 to $18,700.? I tested the EX trim, which was fun to drive and made for getting around in tight Urban traffic. The EX has a 7-inch touch screen display and is powered by a 1.6-liter direct injection 4-cylinder engine that is paired with a six speed automatic transmission. It stands on 15-inch allow wheels. 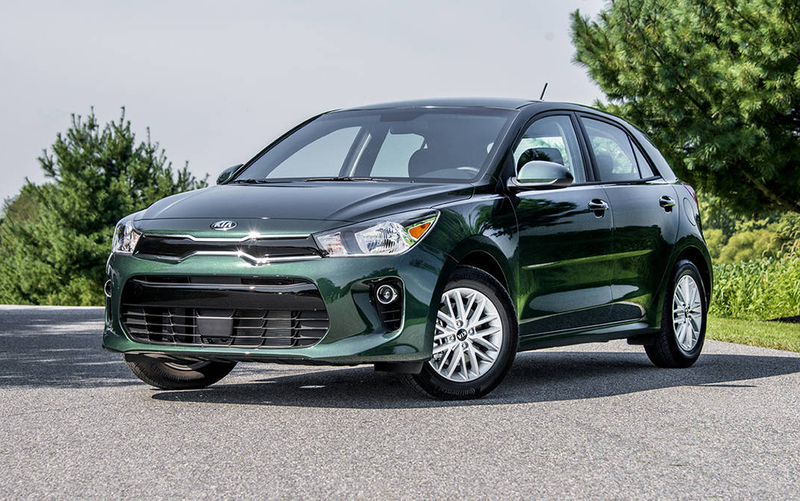 The reworked Kia Rio engine is rated at 28 mpg city and 37 mpg highway. Safety features include dual front passenger, full curtain, and seat-mounted airbags, children seat latches, anti-lock brakes, traction control, electronic stability control, vehicle stability management, hill-start assist, tire pressure monitoring, autonomous emergency braking, forward collision warning system, and a rear backup camera. The Kia Rio has been the companies best-selling car and last year, it sold over 450,000 cars worldwide. This year?s model was significantly redesigned to maintain it?s popularity among cost-conscious consumers. ? Competitors in the crowded subcompact class include the Chevrolet Sonic, Hyundai Accent,? Mitsubishi Mirage, Toyota Yaris, Honda Fit, Ford Fiesta, and the Nissan Versa. ?